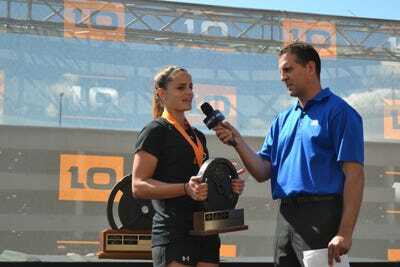 The fittest men and women on Wall Street competed for the crown of “Wall Street’s Best Athlete“on Sunday June 12. 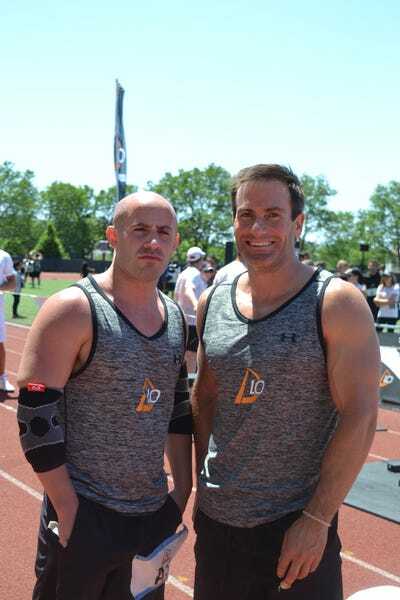 All 110 competitors gave it their all and raised over a $1 million for pediatric cancer research at Memorial Sloane Kettering Cancer Center. 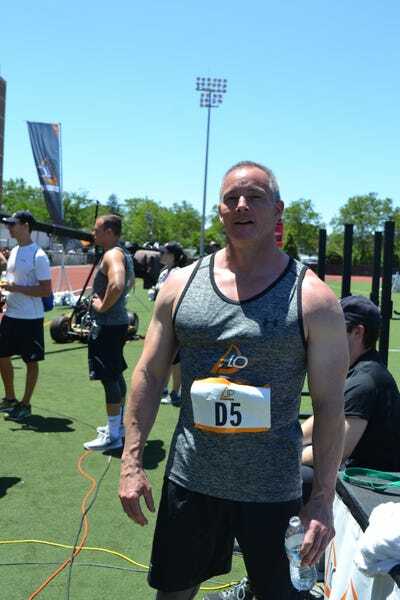 In what ending up spanning 8 hours, the financial industry’s finest competed in events inspired by the NFL Scouting Combine and the Olympic Decathlon. These events are: 400m run, Football throw, Pull-ups, 40yd dash, Dips, 500m row, Vertical jump, 20yd shuttle sprint, Bench Press, and 800m run. Here’s a slideshow of the men and women who vied for the crown. Mark Rubin, 30 and a VP at ICAP, won the title of Wall Street's Best Athlete for the fifth year in a row. In addition to placing first, Rubin raised over $18,000 for charity. Randy Giveans, 31, an associate at Jefferies, placed third won the 400 Meter event. Laura Placentra, 24, a trader at Citigroup, won the award for best female athlete on Wall Street for the second year in a row. 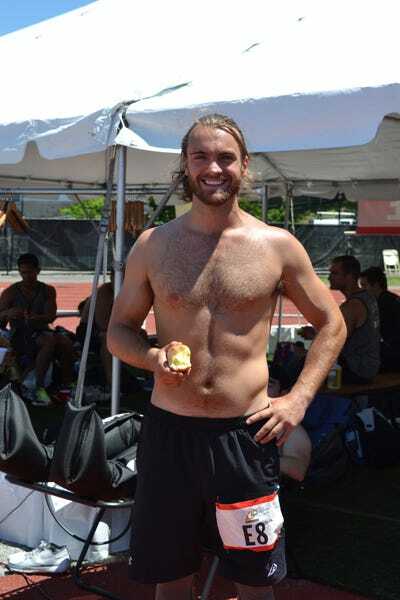 Max Fink, 25, an analyst at Citi, competed for the first time at the Decathlon. His mother is battling cancer and his grandmother succumbed to cancer. He etched their names on his socks and shoes. Todd Woodrick, 47, COO of Pactolus Private Wealth Management, and Michael Scott, 40, a trader at BB&T Capital Markets. Michael Bissmeyer, 37, a director at RBC Capital Markets, won the MVP award for the most points earned and the most money raised. He also won first place in the football throw and 40 yard dash. Michael Greco, 29, KGS alpha Capital Markets. Former Superbowl champion Mike Greco came in second overall in a tight race against the defending title holder. He also placed first in the 500 meter row. Tyler Rowe, 28, an associate at AE Industrial Partners. 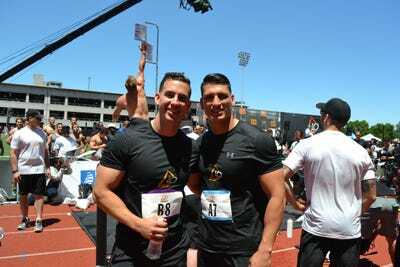 This was Tyler's first time competing in the Wall Street Decathlon. He trained for eight weeks ahead of the event. Brothers Brandon Hutchinson, 27, Merrill Lynch, and Tyler Hutchison, 24, Merrill Lynch. 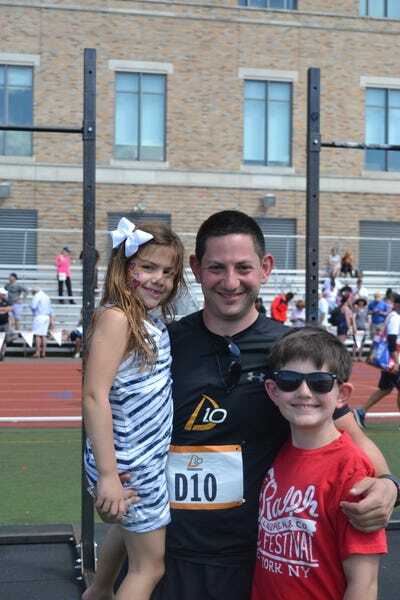 David Carraturo, 51, a partner at IRC Securities, took part in his fifth Decathlon. He trains for it all year. He's doing for charity. 'It gives Wall Street a great name,' he said. John D'Uva, 23, and David Lazarus, 42, of Trillium Trading. 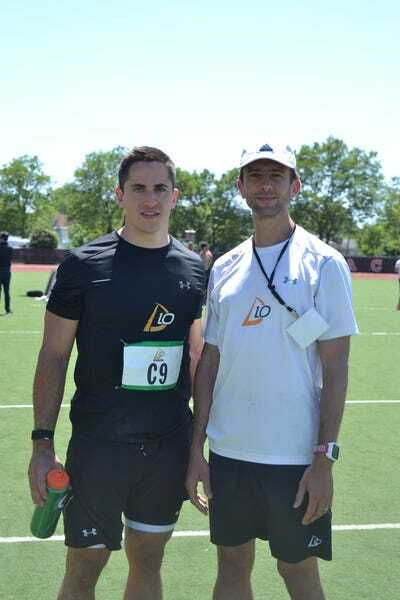 Lazarus and D'Uva travelled from Miami to compete in this year's Decathlon. Lazarus placed number one in the over 40s category for the second year in a row. Connor Kelly, 24, an analyst at Barclays, took part for the first time. The former Princeton football player placed first in the 20 yard shuttle. 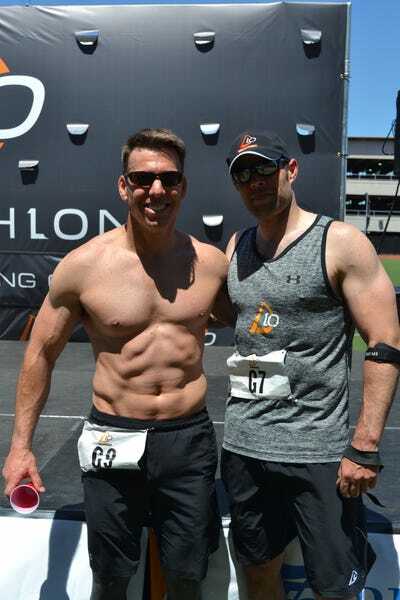 Michael Bennett, 29, VP at JPMorgan and Ted Towle, a Decathlon trainer. Towle organised track sessions every Saturday for the eight weeks preceding the Decathlon for participating athletes. 'These guys are committed to excellence, ' he said. He said the challenge is quantifying a standard for the events due to everyone's variation in biomechanics. It was his third year and his best fundraising year yet with a total of over $14,000. Jason Bear, 29, Compass Asset Management; Patrick Murphy, 27, Key Bank; Karim Laib, 27, Blackrock. Laib, a Blackrock equity research analyst, is a surivor of pediatric cancer. 'There is no extra motivation needed for me to work hard and help raise money for this cause,' he said. Adam Katz, 40, a private wealth adviser at Bank of America Merrill Lynch. Katz suffered an injury to his achilles heel while he was training a few weeks ago. He pushed through to finish at this year's decathlon, and is now finally going to the doctor. He was one of the top fundraisers at the event, with over $31,000 in donations. Even tough guys need a break. The Women of Wall Street. Eleven women competed this year, in comparison to 99 men. 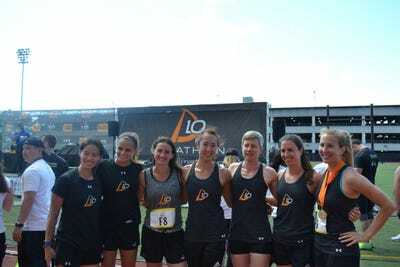 Laura Placentra of Citigroup won the event, while Katie Davis of TD Securities came second and Yiwen Zhu of Goldman Sachs placed third. The DJ played Beyonce's 'Who Runs the World' while the women competed in their final event - the 800M run. Here are the top male athletes of Wall Street. 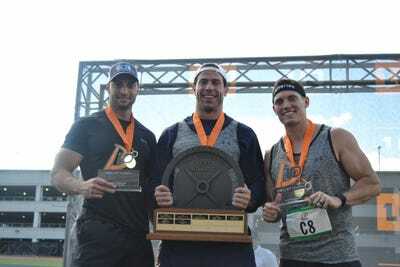 Congrats to Mark Rubin of ICAP, Michael Greco of KGS Alpha Capital Markets and Randy Giveans of Jeffries, for placing first, second and third overall in the men's category.